Secretly hiding in a pub, the Artsy Sip is now getting more and more popular in Penang. Artsy Sip is a place that allows you to unleash your creativity and art sense! Artsy Sip is one of its kind the paint and sip concept that allows you to sip on a glass of wine while having your art piece done with guides from artists. The art studio is located at one of the busiest area of George Town, Artsy Sip housed inside the Seventy7 Pub at Nagore Square. You can easily spot the pub on your left when you turn into Nagore Square. 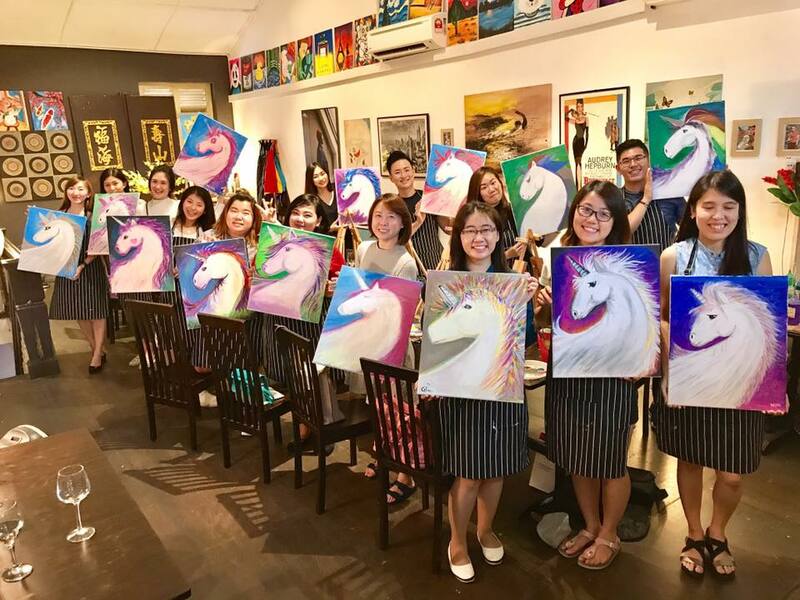 This is probably the one and only paint-and-sip concept class in Penang so far. It is glad to be able to have this fun painting session with friends. This activity is also suitable for kids, family or even team building activities that could bring all of you together and unleash your creativity. 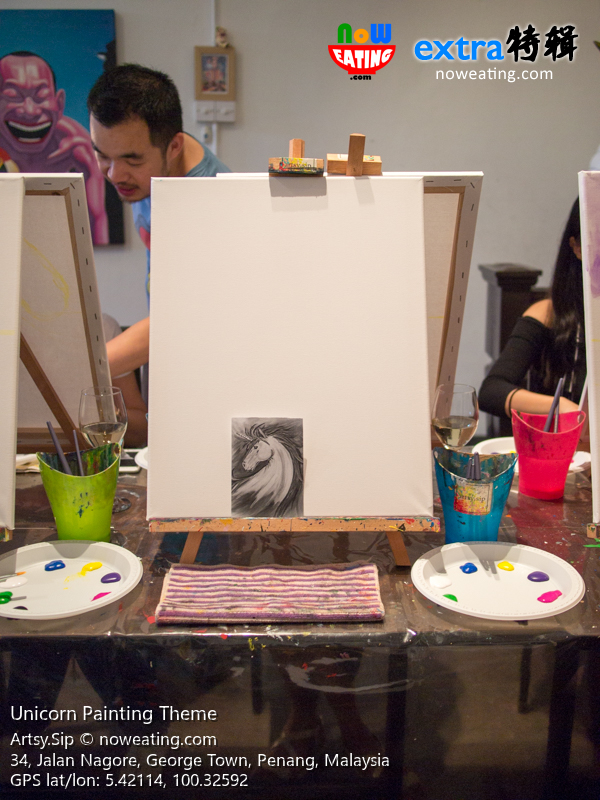 The 3-hour art class is charged at RM88nett. You will get a plain canvas with paints and brushes, you can also bring home your own creation after the class. A glass of wine is also included in the package, for additional drinks can be ordered from the a la carte menu. The place is cozy and well decorated with some previous artworks done by the artists themselves and also some of the creations of customers who prefer displaying their artworks at the studio. The studio has been nicely set up when we were there. The studio can accommodate up to 24 pax, which is a great number for team activity. You can join the individual classes or you can also block the whole place to organize events for your own group of people or company. Our Sifu(teacher) Aaron was the one who conducted our art class. The theme every week will be different, but you can also choose to paint anything you want. He also encourage people to google what they want to paint and then he will guide you accordingly till a masterpiece is born! He will guide all participants throughout the class, so you don't have to worry if you are an art zero person like I do. I'm sure you can create your own masterpiece with sifu's guide. The theme we had that day was a Unicorn! The sample will be printed in a black&white version to let you create your own artwork. You can follow the guideline by you can still unleash your creativity by selecting your own colours. So, ready to create your own masterpiece? A weekend can be well spent. It doesn't have to be the boring shoppings or drinking or cafe hoping anymore. You can now find another exciting activity to add into your bucket list or TO-DO list when you are in Penang. It is such a fun and interesting activity other than watching movie and stuff. The leng zai Sifu Aaron guided us step by step on how we should paint our own Unicorn. We were properly guided and slowly complete our artwork step by step. I've also met some friends during the painting session and all of them have done beautiful jobs as well! This is my own painting halfway through. Scroll down for the finished job. A cute and beautiful pink Unicorn painted by one of the participants! We were all amazed by the beautiful painting! After a long 3 hours of struggling, getting my hands and face dirtied, sipping lots of wines. I've finally done my own creation! A colourful rainbow Pony Unicorn! Angel and Alvin posing with their masterpieces. I would say that this paint and sip session was really fun and even better when you attend it with your friends! It is a job well done for everyone who participated the painting session. All of them have done a great and colourful job! Artsy Sip painting session is now available for booking. The painting session is only opening on Saturdays for 2 sessions from 2:30pm to 5:30pm and 8:00pm to 11:00pm. If you with to book for a private session, you can gather a minimum of 8 persons and contact them. Private session can be available any day of the week. HERITAGE, a simple word that can mean many things. It's defined as a gem that is passed down from preceding generations; a tradition. The Baba Nyonya culture can be commonly found in Penang, Malacca and Singapore, they are known as the Peranakan Chinese or Straits-born Chinese(峇峇娘惹 / 土生華人) and also the first community that created beautiful fusion cuisine in Malaysia, the Peranakan Nyonya Cuisine. Being the 5th generation of the family tree, Baba Jerry learned about the family traditions from his parents, grandparents and have been passing on his knowledge to all the people he know. Baba Jerry and Nyonya Su Pei are the original Hokkien Nyonya that born and raised in Penang and growing up in a Baba Nyonya family is never an easy lifestyle that we normally experience out there. Baba Nyonya are very particular and very strict towards their traditions that have been passed down through several generations. Baba Jerry also told us that he and Nyonya Su Pei have got 500 to 600 recipes that passed down from his grandmother and mother to Nyonya Su Pei. As Baba are traditionally banned from the kitchen, hence all cooking skills and recipes went to Nyonya Su Pei, where Baba Jerry mastered western food instead. He also said that cooking a Peranakan Nyonya meal is to present the food, culture and taste of the family as every Nyonya families will have their own secret recipes and cooking methods which made them different but unique. We were told that what we were about to experience is a heritage food trail, the taste that have been passed down for 5 generations in his Peranakan Nyonya family. 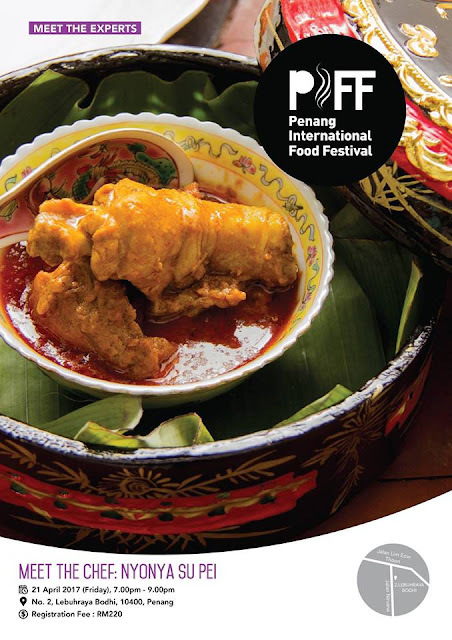 In conjunction with one of the grand festival in Penang, the Penang International Food Festival 2017, Tropical Spice Garden collaborated with Nyonya Su Pei and organized a 2-hour sit down Tok Panjang(Long Table) dinner to promote the authentic Penang Hokkien Baba Nyonya cuisine, culture and traditions. We were told that the traditional Peranakan Nyonya Tok Panjang was missing for 60years, a type of seating that only to accommodate to guests during festivities and prayers, and it is usually with Red or White table cloth, that meant to welcome guests to sit down for a meal with them. Themed "Meet The Chef: Nyonya Su Pei" features traditional cooking of Penang Peranakan Nyonya by the well known Nyonya Su Pei, presenting a few signature dishes for the diners to taste, learn and also experience. The event was held at Nyonya Su Pei Private Dining space, which is located at Lebuhraya Bodhi, somewhere pretty near to George Town, Penang, hosted only about 20 peoples for one session. We were served with a starter named Chai Tao Sui(菜頭酸), a type of pickle which is an essential before we start a Nyonya meal. Every Nyonya restaurant must serve this starter before they present their very first dishes. It serves as a good pellet cleaner and get you ready for a wonderful meal. Throughout the meal we were also served with one of their traditional drink, the Sweet Pandan Mulberry. I would say it is addictive and rather refreshing filled with the fragrant from Pandan leaves. Our very first dish is this beautiful looking Pineapple Kerabu that symbolises auspicious arrival and good beginning. Pineapple is also called ONG LAI in Hokkien dialect and ONG means auspicious in Hokkien dialect. The Kerabu Ong Lai is refreshing, balanced in taste with the mixture of of herbs and spices. It was slightly sour and spicy which gives you a kick and get you ready for the next dish. This appetizer is one of the traditional Nyonya appetizers, it is also a great pellet teaser that is balanced in both herbs and spices. Using pineapple in Nyonya cooking is mainly influenced by Thai cooking, every pieces of pineapple were properly cut into bite size and mix with all the finely cut herbs. . We were told that apart from cooking, the cutting skills is also very important in this dish, which is the most basic skill a Nyonya must master in her cooking journey. The second dish was a pretty creamy one we had. The sweet potato leaves were nicely cut and still intact with the stems which are very nutritious as have been told by Baba Jerry. Chefs out there will only use the leaves but in Nyonya cuisine they eat together with the stems. This dish is rather sweet as there are 3 main ingredients that enhance the flavour which are sweet potato leaves, sweet potatoes and also coconut milk. Baba Jerry said that this dish is the most popular dish during World War II and it is commonly cooked because it is very easy and cheap to grow potatoes. Furthermore this dish is nutritious and filling. A rather Penang flavours dish would be the Five Spice Loh Bak that is only popular and commonly found in Penang. The Nyonya Loh Bak is surely different from what we can find out there, not only because of the taste but it is also because of the spices they used to make their own "Five Spice", which is unique and made out of 11 ingredients. Even though the Loh Bak is made out of chicken, the Loh Bak was soft and tender, serving it with their homemade vinegar chilli gave it a powerful boost and made it more delicious. We were told that this dish will be taught in Tropical Spice Garden's Cooking School, anyone interested to learn how to make this dish you know where to go. Diners of that evening also left with a pack of their homemade Nyonya Five Spice powder. We were told that there are 4 main soups in Nyonya cuisine and Assam Belai is one of the most popular ones. The fish used for that night was Ikan Kembung and Nyonya Su Pei balanced up the usage of Vietnamese mint, pineapple and tamarind and made this soup addictive. The fresh fish were slowly simmered until soft, even the soup was cooked for 3 days to make it thick and creamy, which followed the traditional cooking of their family. This soup is rather hot that it made us sweat. Sour, spicy and yet so addictive. One of the dishes that I'm most looking forward to would be none other than the curry chicken. This dish is served with Vietnamese mint, Nyonya ketupat, homemade sambal and also soy sauce. Before we start savouring this dish, we were told that this dish is usually included in the full moon package for certain traditions and meaning. The red colour in curry chicken represents prosperity, and chicken represents Phoenix, which is the mother of the family. It is usually served in 谢篮(A type of traditional basket that represents thankful and sincerity) together with Eggs dyed in red colour that represents new birth, Nasi Kunyit that represents wealth and Ang Ku Kueh which represents longevity as a gift for new born's full moon celebration. 4 . Replace the plain rice with Nyonya ketupat can enjoy them differently. Every methods gave a different taste, adding a bit of extra stuff gave it a boost and making the Gulai Chicken tasted better. To put an end to this sumptuous meal, we were served with a traditional dessert, the black glutinous rice soup. It is served with roasted shredded coconut in tangerine flavour and fresh creamy coconut milk. The black glutinous rice soup was good to go on its own, but some people like me would prefer it with the creamy coconut milk. What's so special is the shredded coconut that made it different, making it refreshing, salty and citrusy which I couldn't find it out there. The master chef and the great people behind the show. We were all lucky that Tropical Spice Garden also gave us a little souvenir. The Masala Chai, a gourmet spice blend specially prepared by Tropical Spice Garden. The private dining was not just a dinner, but also a great lesson for us to learn about Baba Nyonya culture, traditions as well as the cuisines they have passed down from generations to generations. Through Baba Jerry's teachings, we have learnt that Nyonya cooking is not about AGAK-AGAK(estimation), it is because the Nyonyas in Baba Nyonya families are very experienced and skilful that they can adapt to any variable changes and easily adjust their recipes to churn out with delicious dishes from their years and years of experiences and mastered in herbs & spices. Baba Jerry: "We wish to tell the whole world that Penang Nyonya cuisine is revived and will be passed down to many more generations. Legacy must be passed on, we worked our best to promote the Penang Hokkien Baba & Nyonya culture to the world." A group picture with all the diners and people behind the show. It was really a great dining experience and glad to meet all of them, we had a lovely evening at Nyonya Su Pei Private Dining space and attended a great lesson. 11050 George Town, Pulau Pinang, Malaysia. Opening hours: By reservation only.